, originally published on July 6, 2008. Needless to say, if WALL-E lived in today’s society and not seven hundred years in the future, he’d be the prime candidate to star in a modern remake of the Ernest Borgnine classic Marty. If you know, it was animated by those wizards at Pixar who by now probably have so many awards that they could possibly build an entire studio out of gold. 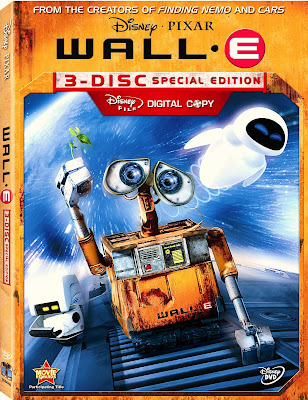 There’s just something instantly huggable about the titular lead character in their latest film WALL-E that turns viewers into the office busybody, the over-eager relative or worse, those smug married friends who all just want to see this adorable Waste Allocation Load Lifter: Earth-Class robot find himself a nice robotic girl already. And while we’re at it, hopefully a fellow movie buff unafraid of director Gene Kelly’s less-than-stellar 1969 Barbra Streisand film Hello Dolly and someone with whom WALL-E can roam his bleak, deserted, overwhelmingly trash filled, sun-drenched and beige version of Earth set seven hundred years in the future where rampant consumerism and greed have taken the color out of everything with nary a blue sky, crystal clear lake, or flower, and one in which humankind abandoned years earlier to live blissfully ignorant, fat and happy reaping the benefits of virtual reality in space." With a bonus third disc that contains a DisneyFile Digital Copy that's compatible with both iTunes and Windows Media Player allowing you to bring the film with you on your laptop or portable video device (like the newest generations of iPods), the true overwhelmingly impressive content of the set is spread out over two state-of-the-art discs. Overall, it features-- as director Andrew Stanton noted in the press release-- documentaries and behind-the-scenes content that "are treated like an AFI special [wherein the Pixar employees]... explain and talk about these things at the level that we talk about them day to day." These were made via Pixar Studio's "in-house DVD department," which lets viewers inside the offices of that amazing studio in order to give us "a huge scope of how much knowledge and talent goes into "every aspect of making an animated film as highly complicated and intellectually challenging as WALL-E.
With a crystal-clear transfer of the film on Disc 1 which also contains a promo clip, trailers, feature-length filmmaker commentary, deleted scenes, and Presto the original animated short which preceded the film, two of the major standouts on Disc 1 come in the form of one of those terrifically detailed documentaries which focuses on "Animation Sound Design" with Star Wars veteran and master sound-man Ben Burtt as well as the brand new, knock-em-dead short BURN-E.
With BURN-E, a new character who like our beloved trash compactor also fulfills a duty, with BURN's being as a repairman, we're treated to an imaginative and ingeniously hilarious action packed and old school blend of comedy and musical choreography reminiscent of the Disney heyday as BURN-E who loves Beethoven's "Ode to Joy" as much as WALL-E cherishes "Hello Dolly" keeps getting interrupted by our mischievous garbage-bot mid-repair. With tools flying off into space and his nerves wearing thin, Stanton's love of both classic Disney animation as well as the work of Kubrick shines through as we encounter a 2001: A Space Odyssey homage in a short that not only was good enough to have been included somehow in the theatrical film but also would've helped aid in WALL-E's overly sluggish, dark, and dissatisfying finale of the otherwise brilliant Pixar movie. Additionally, Ben Burtt's behind-the-scenes struggles to create every single sound effect from the voices of the nearly silent characters Eve and WALL-E to each individual beep and squeak is a fascinating film-school quality featurette that celebrates the history of the Disney sound department as we're taken behind-closed-doors to look at the wondrous artifacts from rain machines and more but also a tribute to our limitless imagination as Burtt toys with a slinky and other everyday devices used in unpredictable ways to create what on the surface seems to be a cacophony of sound but somehow blended together makes the memorable universe of WALL-E. Admitting that it took a full year just to find the right sounds for the main characters, the tireless work from the sound department which is made much harder when working in the realm of animation instead of live action and twice that when the characters seldom speak, is in the end described as consisting of tens of thousands of decisions to ultimately lead to the acceptance of thousands of sounds that when played together help make or break each and every scene that makes it an overall whole. While the second disc is divided into two different menus for film fans or for families and contains so many extras that you could spend days delving into each and every one, by far the most impressive inclusion in the lot was the award-winning director Leslie Iwerks's compelling roughly ninety minute documentary The Pixar Story. Fascinating enough that it could've been released theatrically or at least been submitted into numerous film festivals, it's a wonderful portrait of the approximately twenty year history of the animation studio that chronicles the lives and professional involvement of its three key players-- John Lassetter, a Disney lover who would go onto direct the wildly successful Toy Story, computer and physics genius Ed Catmull who blended together science and programming with animation as he became not only responsible for the first use of 3D in a live action 2D film but also helped transform George Lucas's Lucasfilm Ltd., as well as Apple co-founder Steve Jobs who met up with the Pixar men at precisely the right time, believing in their ability and becoming their greatest financial advocate and backer in a relationship that still holds strong today. Weaving in history of animation and especially the men's love of the classic Disney cartoons that inspired them, along with great insider tales about life at CalArts studying alongside future Disney animators turned filmmakers including Tim Burton and Brad Bird as they were mentored by the lovingly dubbed "Nine Old Men," who helped establish the distinctly Disney emphasis of injecting emotion into hand-drawn images, it's a gripping and passionate piece of filmmaking. The Pixar Story also recounts some of the checkered history between Pixar and Disney when animators were scared to death that 3D and computer animation would make the exquisite hand-drawn lines of the Disney studio obsolete as people began losing jobs in a technological shakeup and Lassetter was let go when his mind and imagination for the blending of animation and technology proved far too daring to his parent studio. Additionally containing some great personal anecdotes from others associated like George Lucas who was always at the forefront, embracing computer potential before it was hip, along with interviews with Lassetter's wife who had to share her husband with the overwhelming demands of Pixar, above all it's an ode to the power of imagination and the oft-repeated thesis that Lassetter notes in that "art challenges technology and technology inspires the art," as so many diverse talents came together whether they were computer PhDs or animators to fully embrace a new exciting medium of filmmaking. A must-see for anyone who owns more than one Pixar film (and I'd venture to say that'd be basically every DVD owner) as well as aspiring artists and history buffs-- much like Disc 1's short film BURN-E, Disc 2's The Pixar Story is not only worth the investment but incredible enough that one wished they would've been included either as a double feature with WALL-E or somehow more been made more accessible to audiences without DVD or Blu-ray players. A beautifully crafted set, despite some clumsy packaging that's a bit frustrating for those whose hands are bigger than WALL-E's as the discs open out sideways, WALL-E is nonetheless packaged to be as efficient and compact as the little, adorable main character himself and sure to capture even more hearts when you can bring him home.